The original source for Durham's potable water. Great pictures! Thanks for braving the barb wire to get them. The dam for the storage reservoir on Nancy Rhodes Creek is still there, just west of the pump station up the trail. And as you walk along the eastern branch of the trail--especially in the winter--you can see the outlines of the old bank of the reservoir. Nice post. I do miss walking on that trail and among the ruins. Dog misses it too. The Huckleberry in-ground water tank sits where it is because that is the highest place in the city. All other water tanks around town are elevated on legs to equalize with Huckleberry. The tank is about 250 feet higher above sea level than Main St. downtown. The primary purpose of the radio tower is for the City/County Public Safety Radio System. The city rents space on the tower to cell phones carriers. I have just recently discovered this very cool spot. Am I correct that Nancy Rhodes Creek and the Eno River were separately dammed? If so, why did they bother damming the creek when they had the river? Also, does anyone know what the three-sided, chimney-like structure next to the Nancy Rhodes Creek dam was for? One last question: the destruction of the facilities looks pretty thorough and deliberate. Does anyone know when this was done? Great pictures! I love hiking this part of the Eno. If you hike on the other side of the river at the Cole Mill access on the Dunnagan Trail, you come to the ruins of a 19th century house and a grave to a "Catherine Dunnagan." I have done a little research, and have found that there are still Dunnagans in the area. Do you have any information about this family and Catherine Dunnagan? I'm curious as to why the reservoir is fenced off? Is it private property? Is there any way to swim there? Love your photos. There are also the remains of another Dam on the Eno just up from the Guess road bridge. We used to live on Open air Camp and always hiked and fished along the river. We went back there about a month ago and walked on the dam and took some pictures! 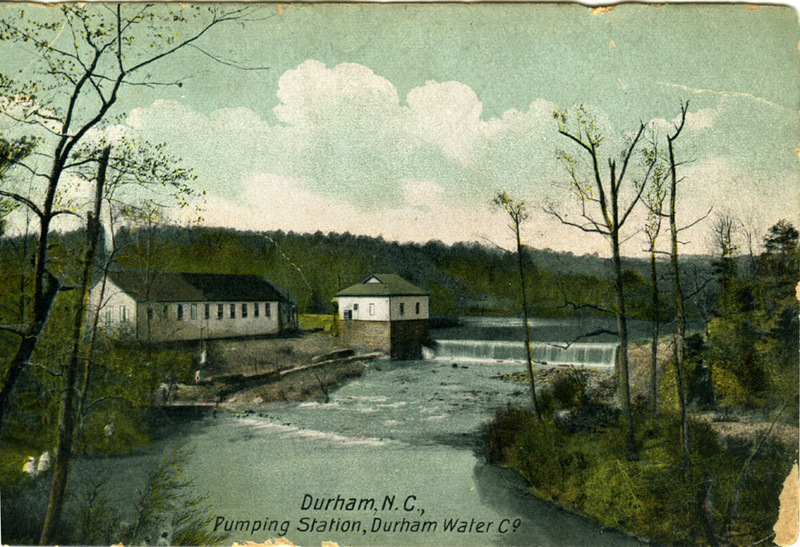 Increasing demand for water in the city of Durham during the 1870s and 1880s prompted the city to enter into a contract with A.H. Howland of Boston to establish a water infrastructure/pumping system sufficient to provide pressure capable of producing 10 streams of water, each 100 feet high, from 10 fire hydrants. The city signed a 30 year contract with the company, with the proviso that equipment and installation would be approved by a city engineer. 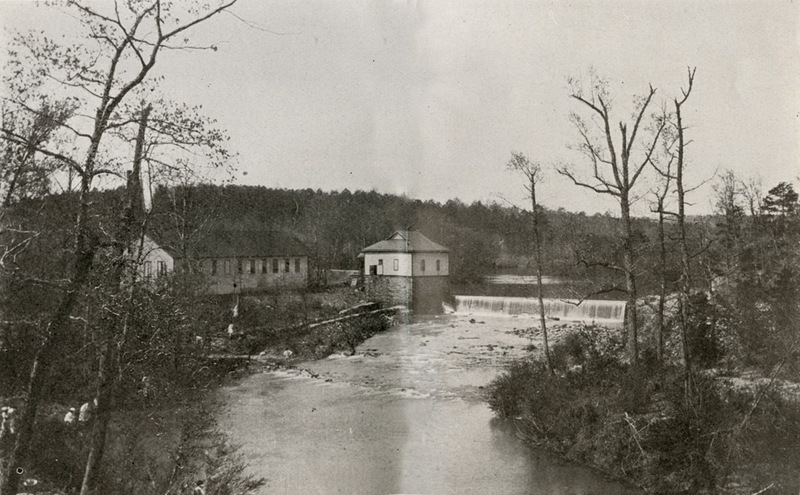 In 1886-1887, Howland and WF Ellis, along with 75 laborers and 2 blacksmiths constructed a 100 foot dam across the Eno River at the point Nancy Rhodes Creek empties into the river. The pond formed behind the dam would hold 6 million gallons of water. A pumping station would pump water from the river up to a reservoir 8300 feet away atop Huckleberry Hill. This 3 million gallon reservoir would gravity feed the city of Durham. 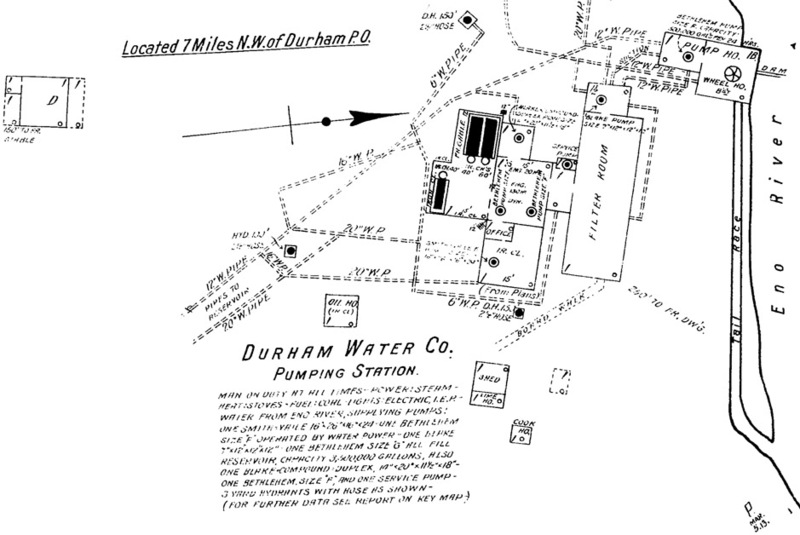 The Durham Water Company was formed in November 1886 to operate and maintain the water system. Eugene Morehead was president, WW Fuller was the attorney, Howland and Ellis the managers. 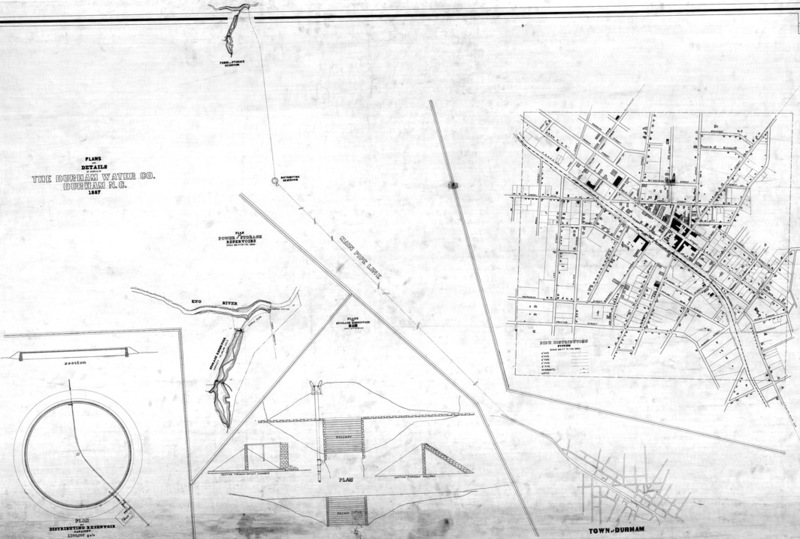 Plan of the waterworks, 1887. Get a full size view from Digital Durham, by clicking here. The water system was a repeated source of problems. Howland and the city disputed the size of the water pipe to be installed, and after numerous delays, the city agreed to accept the water system in April 1888, despite the fact that it had failed to meet the benchmarks demanded by the contract. Citizens lodged ongoing complaints about water pressure and inconsistent service. The company went into receivership over lawsuits from the McNeal Pipe and Foundry company, who had not been paid for their work. Fires that destroyed numerous in-town businesses in 1894 and 1895 demonstrated that the company's water supply was insufficient for firefighting. Howland resigned from management of the company, and John C. Michie replaced him. Michie found muddy water containing dead fish in the reservoir, and began work to replace filtration systems and cement the reservoir bottom. The water company went into receivership again in 1898, owing various parties $194,000. The city entered a new contract with John D. Hardy of Boston to run the water service, but conditions were little improved. Same view as above, 1905, in a colorized postcard version. After the major fire of 1914, the city purchased the entirety of the system in 1916. 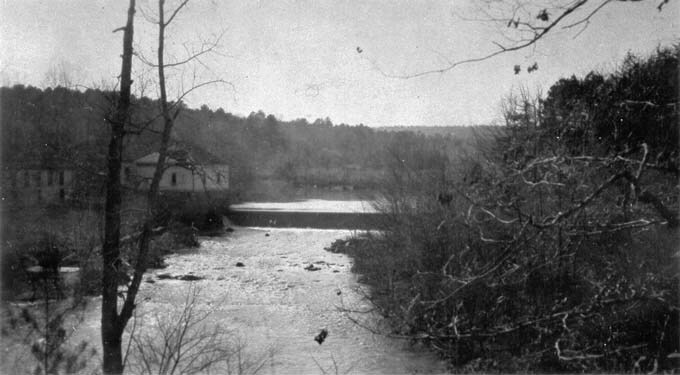 The city decided at that point to establish the Flat River as its primary water supply and began planning the Lake Michie dam. Pumping station on the Eno, 1917. Concrete being added to the bottom of the Huckleberry Hill Reservoir. The construction of the reservoir and filtration system at Hillandale Road followed soon thereafter, that same year. The Eno pumping station and Huckleberry Hill reservoir continued to be used as a backup system for some undetermined period after the Hillandale plant was established, but eventually all production was shifted to the Lake Michie/Hillandale systems, and the old water system on the Eno was seemingly abandoned. Interestingly, the idea of an Eno reservoir resurfaced by the 1960s - I'm not sure where the proposed location of the Eno dam was. The Eno River Association was formed in 1966 to combat the idea of damming (and damning) the Eno. They managed to beat back this proposal, and the city would eventually dam the Little River at Orange Factory instead. The Eno River State Park was formed in 1973. One of the trails in Eno State park is the Pump Station trail, which takes you by the ruins of the old pumping station. Ruins plus a nature hike is my kind of adventure. I scaled the hill east of the pumping station to try to recreate the historic view above. Trees prevented the same view, but the below shot is a rough approximation. Further west is the stone foundation of the pumping station, visible in the historic photos above. The ruins of the filter room are off in the woods to the south.